Civil rights movements have often sought out figureheads with unblemished pasts. The Montgomery bus boycott would have started nine months earlier if Claudette Colvin, who refused to yield her seat to a white person, just as Rosa Parks was to do, had not turned out to be pregnant out of wedlock. Forty-two years later, similar sentiments led legal strategists for gay rights to downplay the fact that John Lawrence and Tyron Garner, of the Lawrence v. Texas case, were not committed lovers but casual acquaintances arrested in the wake of a party. Such elisions may be instrumentally useful in pursuing justice, but they are also problematic: in aggregate, they imply that the law is more urgently applicable to those conforming to certain straitlaced norms. In that way, I am actually relieved to discover that Trayvon Martin, who was killed by gunshot a month ago in Florida, wasn’t a Jehovah’s Witness. Indeed, the ordinariness of those involved in this tragic incident—of both Trayvon and George Zimmerman, the man who shot him—is a fact that deserves to be appreciated in its own right. It turns out that Martin had smoked pot, and was fond of profanity. Predictably, and sickeningly, the right is exploiting the less-than-sterling aspects of his life to suggest they should have some bearing on how we judge George Zimmerman’s having shot him dead. In point of fact, all they prove is that he was an ordinary American teenager. The weed and the salty language are par for the course among more than a few of my favorite undergrads I teach at Columbia. Yes, Martin jauntily labeled himself with the N-word, but as endless threnodies over the past 20 years have stressed, absolutely nothing could be more typical of someone of his age and demographic. At the same time, George Zimmerman is likely not, as some on the left have suggested and seem to almost hope, a drooling racist monster. The details of what happened between him and Martin remain under-explored and likely will never be known in full. However, after last week’s revelations, it looks ever more as if Zimmerman’s claim of self-defense, as absurd as it sounded from the briefer version of things we had last week, holds a certain amount of water. Yes, Zimmerman deserves to spend a long time behind bars regardless. Even if Trayvon had been a thug, Zimmerman would have had no business detaining him. However, let’s face it: It’s hardly implausible to suppose that Trayvon got the best of Zimmerman in physical combat. (Zimmerman claims that Trayvon initiated the scuffle: if so, few would blame him under the conditions.) Two weeks ago the word was that Trayvon was a “140-pound boy,” but he was in fact over six feet tall, weighed more like 150 pounds, and was certainly in a position to overpower a paunchy man of 5 foot 9. At this writing, ABC News has revealed, with enhanced video, that Zimmerman would appear to have indeed had bloody scars on the back of his head when taken into custody, as he claimed. If this is what happened and Zimmerman shot Martin in alarm, then his two principal sins remain: of stopping Martin in the first place, and carrying a gun at all. A less regrettable outcome that night would have been that Trayvon Martin beat up George Zimmerman and went home. Only Zimmerman’s packing heat allowed the possibility that anyone would be shot, much less killed. Of course, it was inevitable that the issue of race was going to be raised by this incident and the subsequent investigation—not least, because, by many accounts, Zimmerman had a history of seeing young black men out and about as looking “suspicious.” However, his many acquaintances who describe him as a mentor to assorted black children are probably not lying in concert. And meanwhile we’ll all recall Jesse Jackson’s famous comment about being afraid himself when approached by a group of young black men at night. Few interpreted it as meaning that he hates black people. How many Americans of any color can honestly say that when they see a black 17-year-old across the street they process him as exactly as unlikely to be “up to something” as they would a blond boy? Absent the gun, the difference between George Zimmerman’s mindset and that of the average American is a matter of degree, not kind. But the left would be mistaken to use this incident as an occasion to raise the specter of an inherently evil American culture unmoved by black boys shot down for no reason. Indeed, much of America is rather vibrantly dismayed by the Martin case. Instead, Trayvon’s death only underscores the often banal and challenging subliminal nature of racism in today’s America. One lesson is that our gun control laws are a global disgrace—and we see the evils of this as much within the black community as beyond it. The other is that America must be able to hold two things in its mind at once, as Zimmerman did not: that black men commit a disproportionate number of crimes compared to their representation in the population and that the statistical facts do not justify intruding upon the peace and comfort of individual black men, short of powerfully urgent justifications of a kind Zimmerman had nothing remotely resembling. 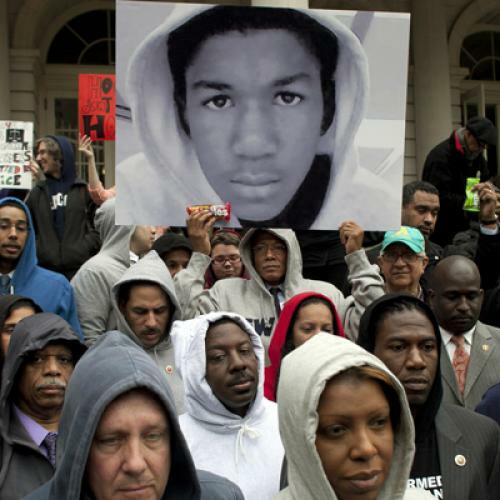 However, regardless of whether Zimmerman is ever charged with a crime, America should avail itself of the opportunity to get to know Trayvon Martin, and by extension the ordinary black culture of which he was a part, a little better. Trayvon’s stepmother has described him as having “swag,” a quality whose manifestations in gait may well have contributed to Zimmerman’s sense of his being “suspicious.” We all ought to be able to agree that, in a better America, Trayvon should have been able to just swag on home.